The first time my teacher asked me to do eagle pose, I thought she was kidding. I have to cross my arms in a super-awkward position that's also a really intense shoulder stretch, cross my legs in a way that makes my outer hips cry for mercy, and somehow figure out how to tuck my toes behind my calf—while balancing on one leg? And you expect me to still “breathe smoothly and evenly” while I'm at it? LOL! But no, this pose was no joke. Garudasana (often translated as “eagle pose,” though technically a garuda is not actually an eagle but a glorious mythical bird) is a challenging balance pose that's quite common in contemporary yoga classes. Whether you practice vinyasa, hot yoga, or Iyengar, you've probably encountered eagle pose at some point in your yoga-life. Although it felt good to know I wasn't alone in my garudasana aversion, I really did want to learn to “make friends” with this pose. It might never be my favorite, but I did want to quell my urge to hightail it out of the studio every time the teacher called out “eagle”! I mean, this pose is said to provide a ton of benefits—including improved balance, lower-body strengthening, hip opening, and relief for an achy upper back and shoulders. All of which I figured I could probably use. I began to focus on each piece of the pose, and how all of the pieces fit together, as opposed to seeing eagle as one big uncomfortable shape. For those reasons, I challenged myself to include garudasana in my morning practice every single day for a year. Although it was initially unpleasant, I discovered that with consistent practice, my balance began to feel steadier, my hips less stiff, and my shoulders less grouchy. But it wasn't until I assisted one of my teachers during a training, and watched her break down the pose step by step, that I really started to gain an appreciation (and even genuine affection) for this asana. I began to focus on each piece of the pose, and how all of the pieces fit together—as opposed to seeing eagle as one big uncomfortable shape. And you know what? Garudasana is no longer my least favorite asana! (That honor now belongs solely to chinstand). If eagle pose has you flummoxed, or if you just want to break it down a little more, here's a quick step-by-step tutorial, along with a few helpful “yoga hacks” to help you navigate some of the trickier parts of the pose. Begin in tadasana (mountain pose), with your feet either together or two-fists distance (about four to six inches) apart and parallel, knees slightly bent. Some yogis prefer to start in utkatasana (commonly known as chair pose), so that they're sitting deeply in the pose from the very start. Experiment with both and see what makes the most sense for your body. Shift your weight into your left foot and cross your right thigh over your left. See if you can hook your right foot behind your left calf. But what if I can't hook my foot behind my calf? Use your right hand to move your right (top-leg) sit bone up and out to the side; this creates more space and accessibility in hooking your top foot behind your standing leg shin. Once your foot is in place, draw your right hip crease back to re-level your pelvis. Next, cross your left elbow over your right (like you're giving yourself a hug) and bring the palms of your hands (or the backs of your hands) together. What if I want a little more stretch, but I can't quite bring my palms to touch? Instead of pressing your palms together, hold your left thumb with your right fingers. This variation offers a slightly deeper stretch than placing the backs of your hands against each other. To help with balance, rather than tucking your top foot behind your calf or letting it hang, rest the ball of the top-leg foot on a yoga block. Garudasana is most often taught with the opposite arm as leg on top (if the right leg is on top, the left arm is on top, and vice versa). But when taking class with my teacher (and YI contributor), Sandra Anderson, I noticed that she taught the pose with the same arm as leg on top (if the right leg is on top, the right arm is on top, and vice versa). This seemed a bit more challenging, balance-wise. 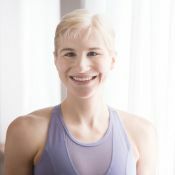 Overall, whether you support your foot with a block or wrap it behind the opposing leg—whether you're crossing same arm, same leg (as Sandy instructs garudasana) or working with opposite arm, opposite leg—the most important thing to remember about eagle (and any asana) is to adapt and practice it in a way that best serves you, your body, and your intentions for practice. There are plenty of ways to refine and align your garudasana for optimal steadiness and ease. To learn to enjoy it, I've had to keep exploring what this pose has to offer and consistently meet it anew. One could say that's what soaring, as eagles (and garudas) do, is all about: rising up to the occasion to view something (in this case, a yoga pose) from a larger vantage point—from a curious, possibility-laden perspective.